Sidhil News: Sidhil's Innov8 bed. Star of stage and screen. Sidhil's Innov8 bed. Star of stage and screen. Sidhil beds are no stranger to the arts. The latest acting role, played by our Innov8 bed was in the theatrical production ''‘The Garbage King’, arranged by'' the Unicorn Theatre group. 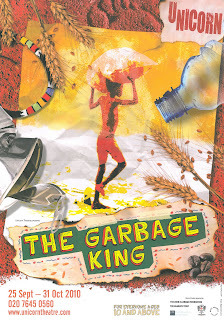 Set in Ethiopia 'The Garbage King' is a tale of two runaway African boys both from very different backgrounds. However the boys have more in common than you might think… Watch out for it hitting a theatre near you soon! This is one of many shows that Sidhil beds are featuring in at the moment. This year alone Sidhil beds have featured on Emmerdale Farm, Coronation Street, DIY SOS to name a few. Watch out for us on a TV screen near you! !